49 years ago today our President, Barack Obama, was born. Today he is celebrating his birthday, without wife Michelle, in Chicago. When asked what he will do to celebrate Obama responded that he will have dinner with friends later this evening. 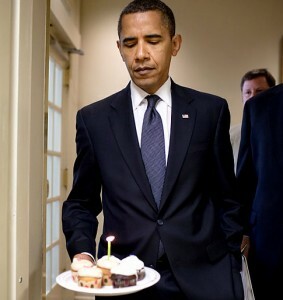 As far as getting a birthday cake, that was nixed too by the secret service. Obama joked while speaking at the AFL-CIO labor federation meeting this morning that although a birthday cake would have been nice, the secret service did not let him acccept a cake from the FL-CIO head. Why is Obama alone on his birthday? Wife Michelle Obama and his youngest daughter Sasha are vacationing in Spain and paying an official visit Sunday to King Juan Carlos and Queen Sofia at their summer home on the Mediterranean island of Mallorca. The First Lady and daughter are joined by close family but did not reveal more details than that. Barack Obama turns 49 years old today. He was 47 when he took office 18 months ago.